Therapy aims to explore the whole person allowing all aspects of their lives, relationships, internal thoughts, feelings, and experiences both past and present, to be explored. 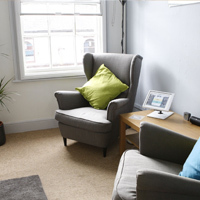 Short term or time-limited counselling is usually focussed on one or two specific issues or themes. We would work together to agree the aims for the work. This would normally continue for between 4 and 12 sessions. The arrangement is always open to re-negotiation and you can decide if you wish to stop earlier or carry on longer. A more open-ended length to therapy is often chosen by clients who wish to have a deeper understanding of issues that are bothering them. There is always discussion and opportunities to review and decide if an ending is appropriate. The aim is to help make permanent changes internally as well as externally. Sessions last for 50 minutes and are weekly. I offer evening and daytime sessions to suit you. I charge a fee of £45-£55 per 50 minute session (the counselling hour). Our first, shorter meeting (30 minutes) is only £10 and is a chance for us to discuss your goals for counselling, ask questions and provides an opportunity to find out whether we can work together. I reserve a certain number of concessionary sessions and this can be discussed on the telephone or during the initial session. You can arrange the introductory session using the contact form.